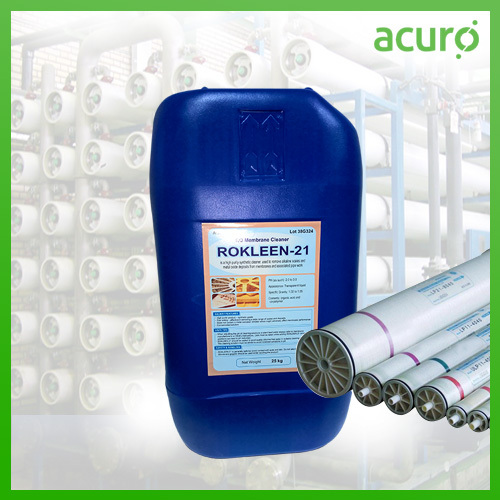 ROKLEEN 21 Low pH Membrane Cleaner is a fast acting formulation for cleaning of RO/NF/UF membranes by dissolving and dispersing organic and mineral deposits which primarily comprise of carbonates and sulfates of calcium, barium, stronium and magnesium. ROKLEEN 21 Low pH Membrane Cleaner is also effective in removing difficult iron scales, metal oxide deposits as well as silicates and colloidal clay. Removes calcium carbonate, metal hydroxides and sulfate scales of calcium,barium, strontium and magnesium along with silica scales.